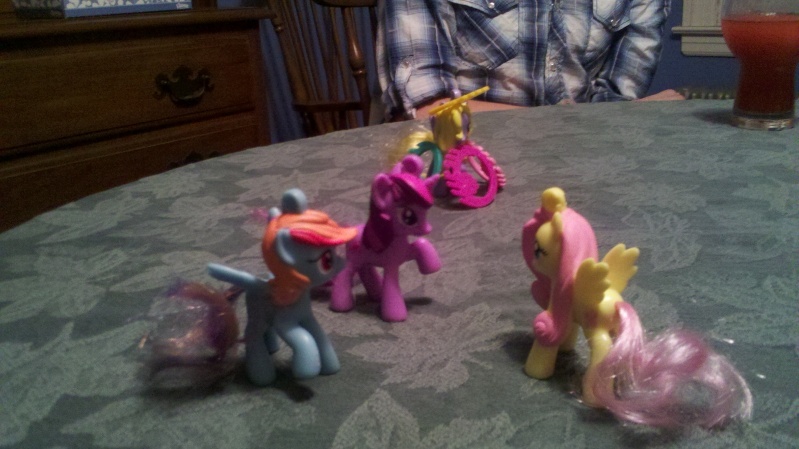 So, I was chillin' with my friends a few weeks ago and the ponies were hanging out with us too. Fluttershy, RD and Twi were just having a good time, relaxing and just being happy. They brought along a "friend" of theirs named Lily Blossom. Rather, she sort of just followed them. They decided to make use of her and had her hold their clip rings so they wouldn't look ridiculous. After an hour or so, Lily Blossom became bored and wandered over to the group. Fluttershy was the first to notice her coming over. As she finally came close to the circle, the three ponies turned to stare at her. "Hey guys...I was wondering if maybe you'd like to let me in on your conversation?" she said. There was a moment of silence. The tension was palpable. Then RD said "GET HER!" and the chase began. 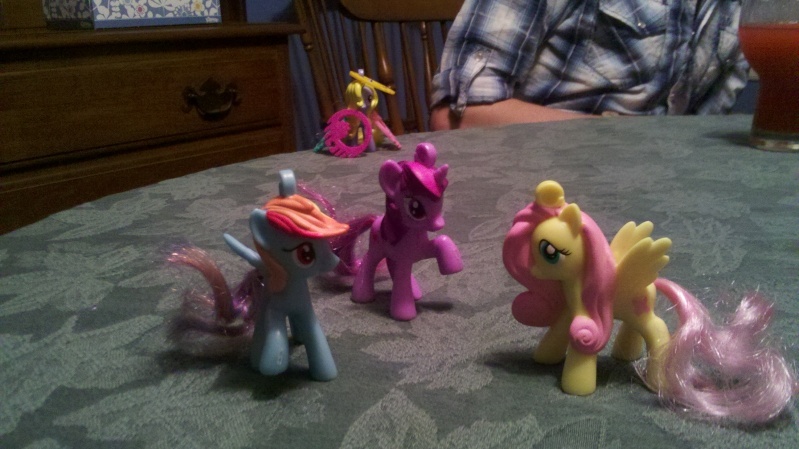 It was over quickly as Dashie flew ahead and dropped down on her while Twi and Shy flanked her. "P-p-please! I only wanted to talk!" sobbed Lily Blossom. "By Celestia's beard, your even more annoying than those 3.5ers. We'll show you what we do to those who aren't part of the G4 herd" said Twi. "Oh, I know! We can give her a bad haricut...that is, if she doesn't mind..." squeaked Fluttershy. "...really? That's the worst thing you could think of? Just get the scissors." sighed Rainbow Dash. "Ok, Lily. Just hold still..." said Shy as she began to clip off Lily Blossom's hair. It was indeed a terrible haircut. Just as Shy was about to finish, Dashie "accidentally" bumped into her and the scissors certainly did their job. "RAINBOW DASH! What are we going to do now!" cried Twilight Sparkle. "Don't worry...i've got it under control" replied Dash with a certain swagger in her voice. 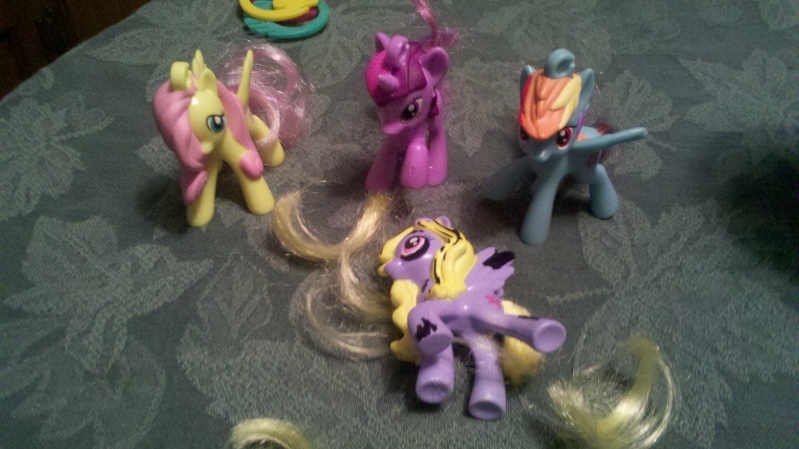 The ponies went outside, dragging the corpse of the recently deceased Lily Blossom. 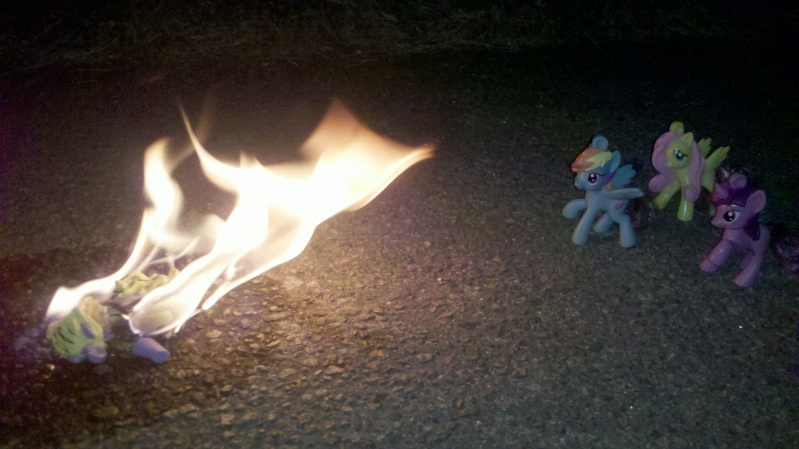 Rainbow Dash set things up and soon, the funeral pyre was ready. RD knew everything was in order, so she lit a cigar and tossed it at the body. Nothing happened despite the gallons of accelerent being dumped on the body. "Huh...that's weird. It worked last week...I just don't know what went"
"...well now. Just had to wait a few seconds. Look at that, girls. That's purity being restored to Equestria." said Twilight as the flames grew higher and higher into the night sky. After the fire died down, the girls went inside to get some sleep. 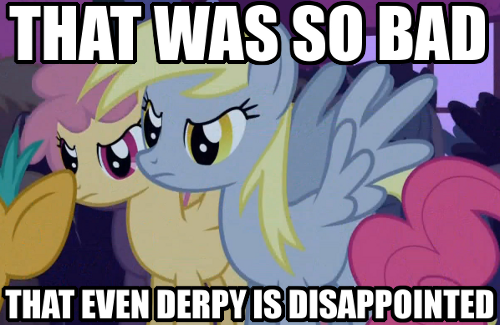 Then there was some fanservice Flutterdash. 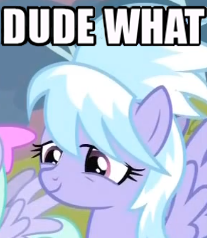 Shame on you Dombah....Shipping Dash and Shy like that! I put this up right before a nap, and waking up to these responses was just amazing.